Today I'm prepping for a class I'll be holding this coming Sunday. My friends want to make a Father's Day card ... I know it's early, but these crafty girls have busy, busy schedules so it's best to get it organized early. 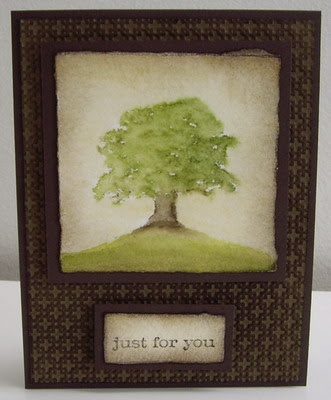 I made an easel card last month with a watercolor of the Oak Tree stamp from Lovely as a Tree stamp set. It turned out so great and they want to make the same card on Sunday. Now, we did a class a few weeks ago and they made their first easel card (for Mother's Day) ... so I'm going to leave it up to them whether they want to make another easel card, or a standard card. I've also purchased two embossing folders since I made my Oak Tree watercolor last month, and both of them would make awesome backgrounds, adding a lot of extra texture to the card, so I've made two standard cards examples, each with a different embossed background, and they will choose on Sunday which background they prefer for their card. It should be fun! I absolutely love the look of the watcolor oak tree and plan on doing a quick (and easy) tutorial on it soon. I inked the oak tree stamp with Stampin' write markers and stamped onto the watercolor paper. I used the Aqua Painter to blend the inks (or you could use a paintbrush or small-tipped sponge and water). I sponged the raised embossing with Early Espresso ink. I adhered all the pieces as per the pictures above, popping up the main image and sentiment with dimensionals. Again, I will be doing a step-by-step tutorial on this card soon!